When a round part is threaded it is inevitable that as the thread reaches the end the shape of the thread tapers and narrows to nothing. The problem with this is that this thin little bit can be sharp and it is prone to being damaged. There are at least two occasions where this is particularly undesirable and the end of the thread, where it is thinner, is cut away. The first is on hosepipe fittings as used by firemen in America. In America these are known as Higbee threads. Without the thinned part of the thread it becomes impossible to cross thread two parts. The second case is on thread gauges. 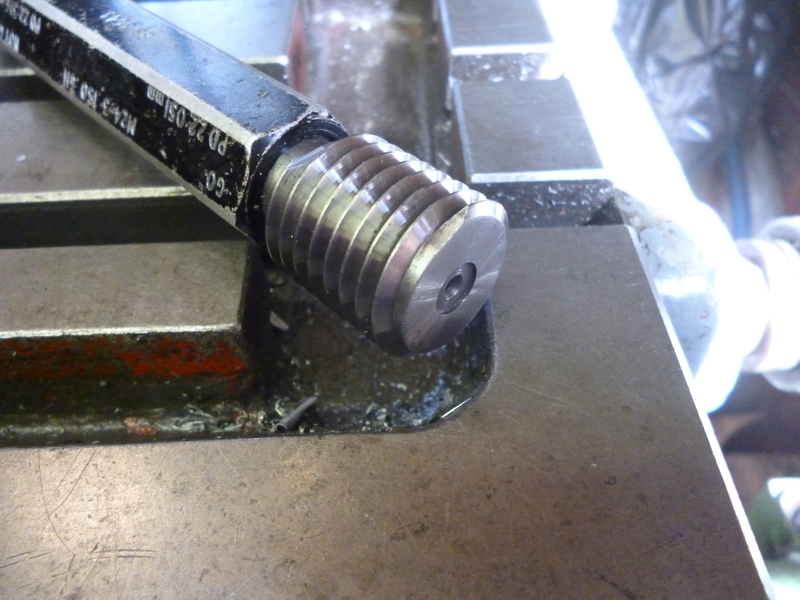 It can be seen that what has happened is that the whole width of the thread has been machined away until what is now the start of the thread is the full width. One way of doing this is to use a milling machine set up as shown. The cutter is an endmill held at right angles to the thread. The dividing head is set so it is horizontal. It is fitted on risers. The verttical head is close to being horizontal but is tiled slightly away from the horizontal. This is so the cutter is at right angles to the thread to be Higbee’d. The dividing head is geared to the leadscrew. The lea required is the pitch of the thread.